Why now is the best time to sell! The media have been banging on for a while now about how the market is down and prices are off etc etc. But, for most people, now IS the best time to sell your property! 80% – 90% of Sellers we deal with are selling to upgrade, downgrade or swap investments. The sale of your own property is just part of the puzzle and we need to put into perspective what that means. Yes! The prices for properties have dropped, but so too have all properties. When property prices boom, it is because there is strong demand and very short supply or number of homes for sale. 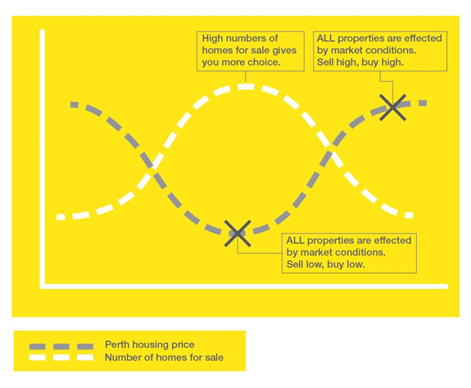 Selling your place in a boom means you are selling high but you are also buying high and because of short supply or low numbers of homes for sale, you don’t have much choice over what you buy. So, at the moment (with high numbers of homes for sale) you have the greatest chance of finding the “perfect” home for your family and situation. So our advice is … don’t wait for the market to pick up as the money you gain will only be transferred to the property you buy. The big value is what price do you place on living in the home you love and have always dreamed of!! This is worth a great deal. © Ray White Whiteman & Associates. Based in Mirrabooka.